Boyce Thompson Arboretum State Park is located in beautiful and scenic Queen Creek Canyon, three miles west of Superior and about 30 miles southeast of Lost Dutchman State Park. 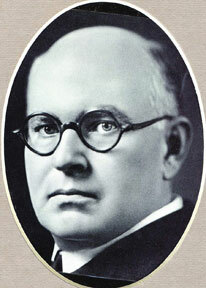 Natural resource developer and philanthropist William Boyce Thompson established the Southwestern Arboretum in the mid-1920’s. The inspiration to create an arid-region arboretum sprang from a lifetime of fervent interest in things botanical, horticultural, and natural. It was specifically inspired by Thompson’s visit to Russia during the terrible famine years just after the First World War. Thompson, who was a Colonel in the Red Cross, came to realize how profoundly dependent human beings are on plants. It was Thompson’s fervent desire to do something to enhance man’s symbiotic relationship with members of the plant kingdom. A man of broad vision typical of the expansive “can-do” times, Thompson along with the Arboretum’s first Director, Franklin Crider, fashioned a mission for the Arboretum that was vast and global in scope with economic utility and aesthetic appeal being of primary importance in accessioning material to the collection. The Arboretum was the first purely botanical institution in this desert State and was founded to promote understanding, through scientific research and public education, for plant-people relationships in the arid and semi-arid parts of the American Southwest and the world. 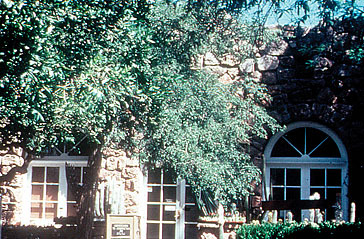 To further goals held in common, Boyce Thompson Southwestern Arboretum entered into a bilateral management agreement with the University of Arizona in the mid-1960’s. This agreement was expanded to include Arizona State Parks in 1976, in recognition of the great recreational, educational, and historical significance of the Arboretum to the people of Arizona. 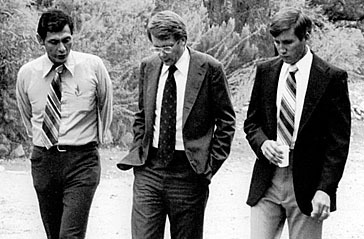 Governor Bruce Babbitt (center) visited in 1978 for Boyce Thompson Arboretum’s 50th Anniversary. In the early 1970’s, State Parks was looking for opportunities to expand its system, and the Arboretum had been identified as a potential addition. At this same time, the Arboretum was facing financial difficulties. In 1972, Dr. Kassander and Dr. Younggren of the University of Arizona approached the Parks Board to see if there was enough interest to pursue a partnership for the operation and management of the Arboretum. The Parks Board was interested and instructed its staff to begin meeting with the Arboretum staff to determine what the Board’s involvement might be. Following lengthy negotiations to develop an acceptable management agreement with the University of Arizona and the Boyce Thompson Southwestern Arboretum Board, the Parks Board signed a tripartite agreement on March 30, 1976. Sharon Haennelt was selected as the first Park Manager. In the years since its creation, the tripartite agreement proved to be a very effective way to support and manage this valuable and complex resource. The arrangement weathered fiscal crises and because of the people involved has grown into a strong and flexible working relationship. Each partner brings to the arrangement the resources and expertise it is noted for. The result is a uniquely beautiful and useful desert garden for the education and enjoyment of the people of Arizona, the United States, and the entire world. Note: Arizona State Parks Volunteer Sylvia Lee is researching a complete history of the Arboretum over the past eight decades. Do you have interesting anecdotes or personal reminiscences … maybe historical photos from the 1930s, 40s, 50s or 60s? Did your parents or grandparents work for “The Colonel” back in 1920 as the Arboretum and adjacent Picketpost House were being built? Please contact Sylvia Lee at [email protected] with information, historical documents, photos or JPGs you’d like to share. Arizona State Parks recently celebrated a 50th anniversary — Boyce Thompson Arboretum tops that by 25 years! Founded in the 1920s by copper mining magnate and Wall Street investor William Boyce Thompson, the Arboretum has grown over the years to encompass more than 1,000 acres — and has become affiliated with the University of Arizona College of Agriculture and Life Sciences and, in 1976, and Arizona State Park. The Arboretum was created from 1923 to 1929 as a museum of living plants to help instill in humanity an appreciation of plants. The articles of incorporation allow for all forms of “experiment, research, study and investigation of plant and animal life” and call for “broadening the public interest therein and knowledge thereof.” Management is a cooperative effort by Arizona State Parks, the University of Arizona, and the Arboretum’s private nonprofit corporation, which owns the physical facility. These three managing partners maintain a balance between public events, academic endeavors, and conservation. The Arboretum is primarily a service-oriented institution seeking to ascertain the types of plants that will thrive within the Sonoran Desert; displaying these and introducing them for use within the state and the Southwest; making seeds available to botanical gardens, arboreta, parks departments and government agencies; and offering a wide range of educational services dealing with plant science and biotic communities. The historic Smith Building was the original Visitor Center. Erected in 1925, it is constructed of rhyolite, a native stone quarried directly across Highway 60. It encompasses an Interpretive Center with museum exhibits and displays. Two public greenhouses attached to the Smith Building display living specimens of cacti and succulent plants brought together from many deserts. The chief attraction at the Arboretum is the system of nature trails, with over two miles of combined length that weave through the botanical gardens. These gardens represent the “living museum” of plants capable of living in the Sonoran Desert of southern Arizona. Many are native species; others have been introduced. A series of shady interpretive ramadas are located along the Main Loop Trail to provide a place to relax, get out of the sun, and learn about the Arboretum’s plants, animals, natural and human history. The Arboretum’s founder was born May 13, 1869 in Alder Gulch, Montana. At the age of 11, his family moved to Butte, Montana. At the same time in Butte's history, the town was experiencing a major mining boom. At 15, William was gambling for major stakes in the local beer halls in the wide-open mining town. He went to public school but displayed little interest. His teachers characterized him as normal, healthy and well intentioned. He disliked study and was thought to be almost dull. He was the least promising of his high-spirited buddies. At seventeen, in December 1886, he was sent East to Phillips Exeter Academy in New Hampshire. His Exeter experiences provided him with social, intellectual, and spiritual maturity. They remained a strong, positive influence all of his life. Although he never graduated from Exeter, in 1889 he matriculated to Columbia University as a student in Engineering. The School of Mines is where he found his greatest interest but did not return after his Freshman year. He returned to Montana to a wide variety of mining ventures. In 1895 he married and settled in Helena, then later in Butte. In 1899 he moved to New York City for an initial exposure to the high-flying world of mining stock investment. His initial thrust was not successful so he returned to Montana where he secured a producing mine, the Shannon. He returned to Wall Street, and by 1904 had demonstrated his ability to return handsome profits for his investments and move on to other ventures. By 1906, through other investing in Nevada, Arizona, and Utah he had made his first million. He continued to pursue Wall Street mining ventures. In 1907, he purchased the Magma Mine, in Superior, Arizona. Meanwhile, he built a grand estate in Yonkers, New York. At the beginning of World War I, he was beginning to enter into politics, which he saw primarily as a way to enhance his Wall Street Standing. However, the war drove him more into national politics, and in 1917, Thompson was sent by the Wilson administration to Russia. To give him proper “credentials,” he was sent as a Lt. Colonel in the American Red Cross. The overriding objective of the Wilson administration was to assure that Russia would stay in the war, and not negotiate a separate peace with Germany. A long struggle to keep the Bolsheviks from power eventually resulted in perhaps a delay of from one month to six weeks and was thought by many after the war to have been a major factor in the winning of World War I. He returned to politics for a short while after the war but disliked politics. He found his greatest interest in a new home he was building in the Arizona hills, near the town of Superior. This is where he built his Picket Post house. When a friend asked him how much land he owned around Picket Post House, he replied, “I own it all as far as the eye can see, because I love it.” The fact was that the first years, he owned none at all. The land was part of the Crook National Forest and the house was built under a permit of the Forest Service. By purchasing land in northern Arizona that the Service wanted he was able to make an exchange that which gave him ownership of over four hundred acres. Thompson is reported to have been happier in his Picket Post home than ever before. He picked Franklin J. Crider, University of Arizona, to establish the Boyce Thompson Southwest Arboretum on a portion of the 400 acres. The initial mission of the Arboretum was to study the plants of desert countries and to make the results available to the public. In 1924 he also established the Boyce Thompson Institute for plant research in Yonkers, New York. After suffering a stroke in October 1925, his left arm and leg were paralyzed. He had driven himself too hard. There were many things he wanted to do. He had dreamed of a rich old age when he would have time to enjoy his home, his garden, his grandchildren. His strength and vitality never returned. After the Stock Market crash in October 1929, he was convinced it was a prelude to a greater disaster. He sold stocks heavily and from the hundreds of millions he had collected in the three previous decades, he was down to his last 100 million in early 1930. He died from pneumonia in June 1930.